The retirement landscape has changed dramatically over the last several decades, with most Americans shifting from guaranteed pensions to do-it-yourself 401(k)s. The transition has left many workers of all ages a little nervous—but that hasn’t necessarily translated into action. A recent survey1 from Franklin Templeton Investments found that more than half of Americans are very or somewhat concerned about their retirement strategy, yet more than 40 percent are not currently saving for retirement. Retirement stress spans generations, too, with Gen Xers and Millennials reporting the highest levels of stress when thinking about retirement (76 and 70 percent, respectively). Baby Boomers: According to the survey, 70 percent of boomers expect to rely on Social Security in retirement, and 29 percent expect medical costs to be their top retirement concern. Continuing to work part time in the early years of retirement can help on both fronts: giving boomers a little more cushion in their budget and, in some cases, providing health care benefits before Medicare kicks in. The regular paychecks can also allow boomers to delay drawing from their retirement funds, allowing their nest egg a little more time to grow. However, some boomers won’t be able to rely on this as a strategy. The survey found that 30 percent of retired boomers left work earlier than planned due to unforeseen circumstances, such as health issues. Gen Xers: In the midst of raising children and, in many cases, caring for aging parents, many Gen Xers have put off retirement planning for the time being. According to a recent Transamerica survey2, 45 percent of Gen X workers prefer not to think about retirement investing until they get closer to their retirement date. That approach has left many behind on their savings. 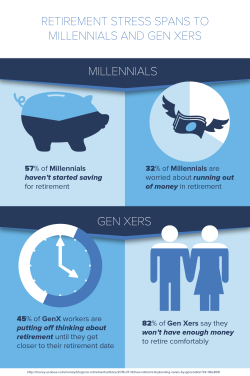 A Northwestern Mutual study3 found that 82 percent of Gen Xers say they won’t have enough money to retire comfortably. Fortunately, there’s still time to catch up. Boosting 401(k) contributions can help Gen Xers, many of whom are in their prime earning years, catch up. Savers should put away at least enough to get their full employer match, experts say. Millennials: While nearly one-third of Millennials (32 percent) are worried about running out of money in retirement, according to the Franklin Templeton study4, this generation has time on its side. Most (69 percent) expect to rely on their 401(k)s for income in retirement, so saving early and regularly—combined with the power of compounding—can help workers build a larger nest egg. Millennials who don’t have access to a 401(k) through work can set up a Roth IRA for tax-advantaged saving. 1 "Attitudes Toward Retirement Are Shifting, Franklin Templeton Survey Finds." Franklin Templeton Investments. N.p., 25 Mar. 2015. Web. 216th Annual Transamerica Retirement Survey (n.d.): n. pag. Transamerica Center for Retirement Studies, Aug. 2015. Web. 3 "Planning and Progress Study - 2015." Financial Research | 2015 Planning and Progress Study | Northwestern Mutual. Northwestern Mutual, n.d. Web. 4 "Retirement Strategies and Expectations Differ Across Generations, Franklin Templeton Survey Finds." Franklin Templeton Investments. Franklin Templeton Investments, 20 Apr. 2016. Web.